Growing up watching the O’s with a hot dog in hand at Baltimore’s Memorial Stadium (R.I.P. ), our younger selves never would’ve dreamed about the endless food possibilities that the ballpark would offer just a couple of decades later. 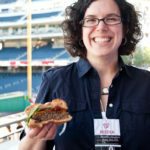 But Nationals Park Executive Chef Terry Louzon showed us last week that ballpark fare goes way beyond burgers, beer and brats. Nationally known for their service at entertainment venues, Levy Restaurants is the company behind the dining and foodservice operation at the park. 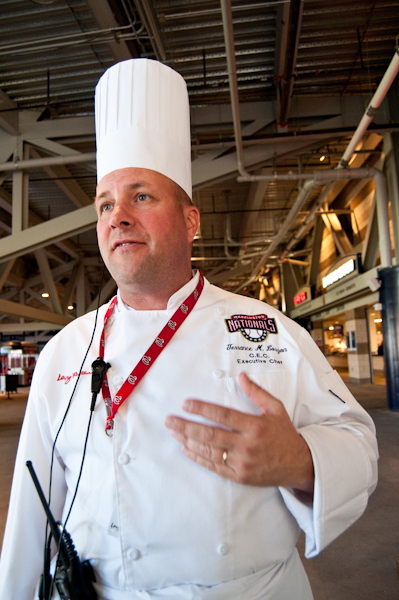 Chef Terry’s creativity and knowledge – he’s a retired Army master sergeant – combined with Levy’s innovation, make for a great ballpark eating experience. Not to overstate the obvious, but…come to the ballpark hungry! 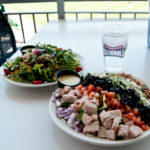 You’ll find your typical ballpark fare, as well as many unexpected offerings, such as the Turkey Cobb Salad with Honey Dijon dressing and the Southwest Steak Salad with Chipotle Ranch. Both salads are Chef Terry’s creation, and are available at the Red Porch Restaurant. Anyone who has a ticket to the game can make a reservation at the Red Porch, just inside the Centerfield Entrance, the most commonly used entrance due to its proximity to the Navy Yard Metro Station. The chef showed us a veggie burger. Samantha was into it and dug right in. Stacey was skeptical. A burger with no cow? No thanks. 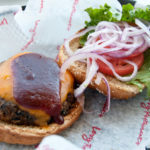 But in the interest of being open-minded, she also tried the black bean and beet burger with brown rice, Levy barbecue sauce, and a dash of cumin on a whole wheat bun. Holy cow – pun intended! 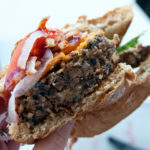 – what a delicious burger! It’s so flavorful that you forget there’s no meat. 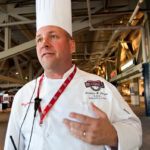 With 81 of the 162 games of the regular season played at Nationals Park, how do Louzon, his five sous chefs and hundreds of other cooks and food purveyors put on their game day game face? “We work 12- to 14-hour days. The gates open at 4:30 p.m.,” Louzon said, which is the time at which the Red Porch offers its first seating. The stands open at center field so that fans can watch batting practice. The rest of the park opens at 5:30. On game day, most chefs arrive around 10:30 a.m., but others come in earlier to get ready for the fans.